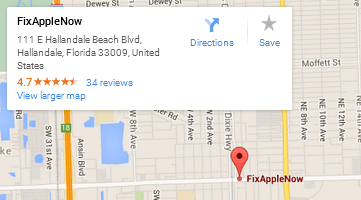 Below you can find driving directions from Google Maps to help you get from West Park to your nearest Fix Apple Now store, situated in Hallandale. You can either copy the driving instructions below or click here for a larger map and driving directions. Don't settle for an inferior service – choose Fix Apple Now if you need to fix, mend, replace or restore your iPad in West Park. We are here to deliver the outstanding service you require, and you can count on us to go the extra mile to beat your expectations if you need to repair a broken iPhone 4,5 or 6, iMac, MacBook Pro, MacBook Air, iPad or iPod. We can count some of the most experienced and skilled engineers in the business amongst our team, so don't head anywhere else if you require a first-class Apple repairs service. Talk to us today if you're facing boot loop, crashing apps, a frozen or cracked screen, crackling audio, an overheating phone or features like Bluetooth and Touch ID are no longer working. We are here to put things right and reunite you with your device quickly. Talk to us if you need to fix your iPad or iPhone in West Park at the best possible price.